Clerkenwell Parochial Church of England School has a long, proud and, in many ways, unique history. Established in 1699, it was one of the very first charity schools, at at time when there were only 19 such schools in London and Westminster, and when of course there were no state schools as there are now. The school was then in the parish of St James, and was originally founded by the parish church, indeed the first headteacher of the the school, John Honeycott, was at one stage Parish Clerk at St James. The school began life in an apartment in Red Bull Yard (see left) which is now part of Woodbridge Street - a link that is still maintained to this day, as the current Year 5 class visit Woodbridge School in Suffolk for a 4-day residential trip every year in the summer term. 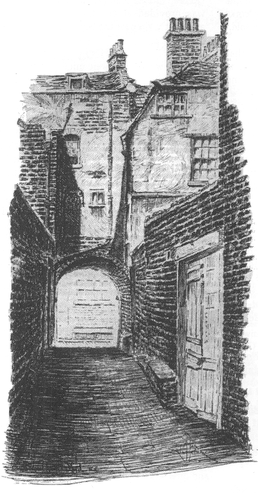 In 1759, after the school had been located at various addresses, it moved to the corner of Aylesbury Street/Jerusalem Passage, before, in 1828, it moved finally to its current address of Amwell Street, where it has been ever since. The school building is believed to be the oldest purpose-built, state-school building that is still operating as a place of education in London. Famously, the school was a venue for 'penny-readings' by Charles Dickens in the 1860s, which should come as no surprise as Dickens was a local and his illustrator had a road named after him only 200 yards from the school (Cruikshank Street). This heritage is celebrated to this day in the names of the four 'houses' for whom the present day pupils earn points: Marley, Nancy, Dorrit and Twist. Later in the mid-twentieth century, Mrs Mann, the first female headteacher of the school, took great pride in keeping the school open during the second world war, providing a bunker in the playground for the pupils to hide in during air-raids. At the turn of the twentieth century, Queen Elizabeth II visited the school to help it celebrate its 300th birthday. A plaque in the hall commemorates her visit. In 2015, the school is now 316 years old and still going strong. We have an archive outside the main office with various photographs and records on show, including letters by ex-pupils, some old punishment books and even nineteenth century inspection reports. Another display near the staffroom on the south side of the main building also displays various selected records of the school archive. Viewings of the school archive, much of which is under lock and key, can be arranged by appointment with the headteacher. If you would like to read more about the history of the school, please click on the information booklet below.